Deployment drone in pilot project in Papua New Guinea, a country which presents some of the most challenging terrain for seismic acquisition in the world. Image credit: Total/RPS. There is a long-held adage that two heads are better than one – so why not 25? That was very much the approach taken by the R&D department at supermajor Total, when faced with the issue of acquiring high quality onshore seismic over difficult terrain with minimum environmental and societal impact. Conventional onshore acquisition systems tend to require many people on the ground, physically laying out lines of multiple sensors, which in mountainous terrain and poor weather conditions can be treacherous for the personnel. In rainforest and other highly vegetated areas, this also requires hacking paths through the undergrowth and disturbing wildlife and possibly indigenous communities, all very undesirable outcomes. A totally new approach was required. Back in 2015, Total began to consider innovative ways to tackle these issues and rapidly realized that finding a successful solution using only in-house resources was not feasible. “We needed to access modern disruptive technologies to address many of the issues,” explains Pierre-Olivier Lys, Innovative Acquisition Manager at Total E&P’s Research and Development Center in Pau, southern France. “To do this we needed to go outside the company – and in some cases outside the industry.” Thus, the Multiphysics Exploration Technology Integrated System (METIS) project was born, with the mission to ‘improve the quality and speed of data acquisition through realtime quality control and processing, while at the same time slashing both the cost and HSE risks of operations’. In the pilot project the DARTs successfully embedded themselves in the ground and transmitted data. They are designed to be biodegradable, leaving no trace after the survey is completed. Image credit: Total. One of the first questions to address was how to put recording sensors in place without using personnel on the ground. For this task Total teamed up with Wireless Seismic, a leading innovator in real-time and cable-free seismic data acquisition systems for the oil and gas industry. Their unique technology allowed Total to develop a revolutionary system of receivers deployable through drones, transmitting data via a high-speed, real-time radio telemetry system. These recorders, known as DARTs (Downfall Air Receiver Technology) are, as the name implies, shaped like a dart and can impale themselves in the ground in an upright position. Each of the prototype wireless sensors weighs under 700g and is less than 50 cm long. Ultimately, their size and weight will be decreased (300g and 25 cm long), and all components will be harmless to the environment. The body today is made of biodegradable polylactic acid (PLA), a type of plastic, and the research teams are already working with existing technologies to ensure that eventually every part of the DART, including the battery and sensors, will have a negligible environmental footprint. To this end additional partners in the project are battery specialist company SAFT, recently acquired by Total, and the multidisciplinary research organization VTT Technical Research Centre of Finland, which in this project is specializing in printed and hybrid electronics and biopolymer studies. Once the DARTs are in place, Wireless Seismic provides the seismic recording infrastructure that allows the data to be transmitted from the sensors to intermediate antennas, which in turn send the information on to a central location using the radio telemetry system. This communication system is therefore providing real-time data, which can be analyzed to create preliminary images to monitor the quality of incoming data, so changes can be made to acquisition parameters to ensure optimum results from the survey. The drones were designed by ISS Aerospace to carry a number of DARTs simultaneously. 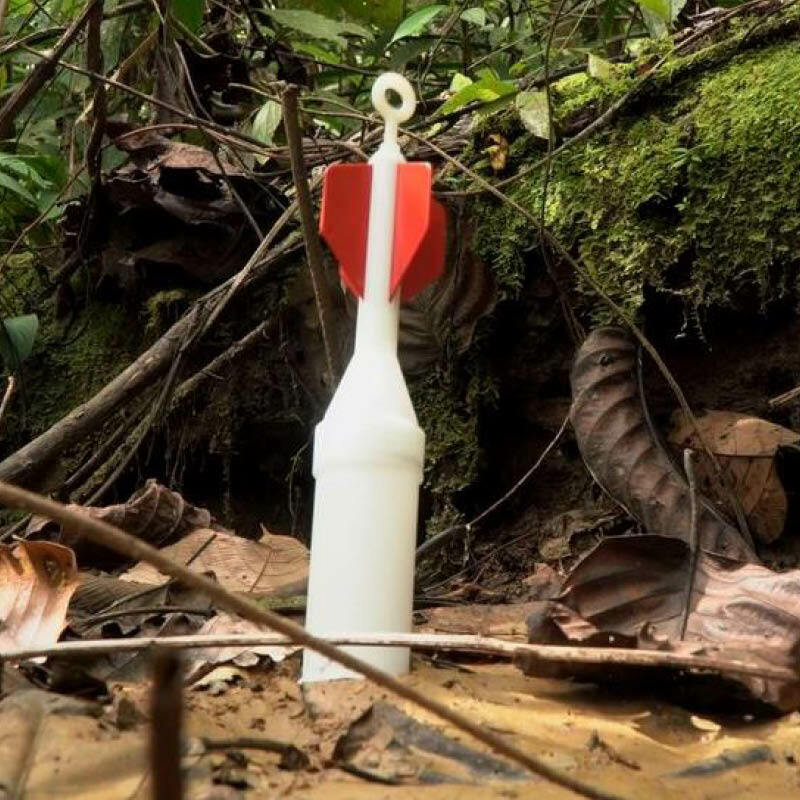 Finding a location to drop the DARTs through the rainforest canopy can be challenging. Image credit: Wireless Seismic/RPS/Total. The DARTs will ultimately be deployed by fleets of autonomous drones that undertake a multi-physics safety clearance check before releasing the sensors over prearranged optimized positions. 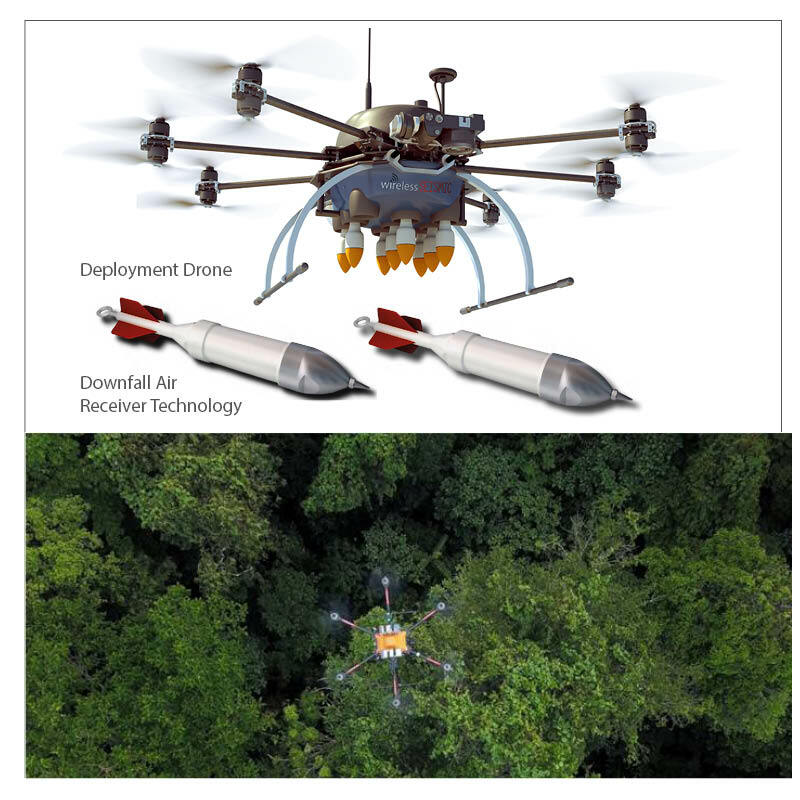 These locations have to be chosen with care, particularly in dense forest, to ensure that the sensors can reach the ground through gaps in the foliage and will be able to penetrate the forest floor. Another collaborative partner, RPS, is responsible for flying the drones, designed and manufactured by ISS Aerospace, and for the DART deployment, while satellite data, LiDAR and airborne electromagnetic and gravity companies provide the information needed to precisely model the surface before the sensors are dropped to ensure they can reach their target point through the canopy. They are released from about 20m above the trees, and multi-sensor cameras are used to check that the ground is free of people and animals before they are released. A simulation of the airship which will be used to transport equipment to and around the survey area. Image credit: Total. 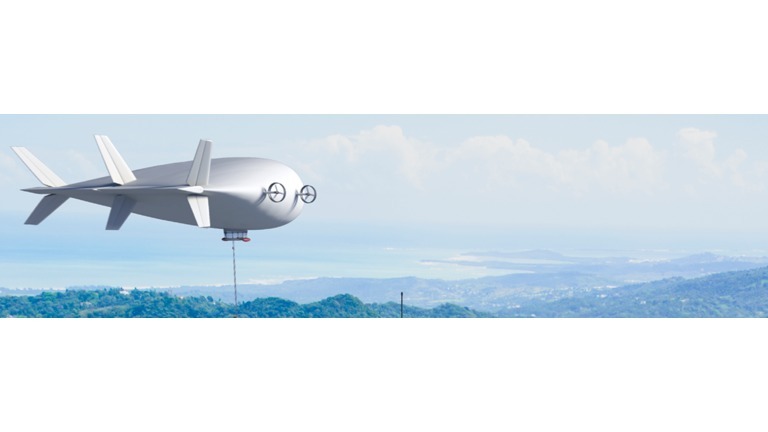 To ensure that the footprint on the ground is as limited as possible in environmentally sensitive areas, Total have teamed up with aeronautical experts Flying Whales to create a multipurpose inflatable airship. This will transport all the equipment for the seismic sources, plus any material required to set up camps in the survey area. At the end of the project, all non-biodegradable material will be removed from the site using the airships and the area will be allowed to return to nature. “We consider the airship a very important aspect of the project,” Pierre-Olivier adds. Another major partner in this project is the geophysical services company Geokinetics. As specialists in the acquisition and processing of seismic data in challenging environments worldwide, Geokinetics will ensure that all aspects of data production, from survey design and modeling to seismic processing and imaging, are integrated in order to provide the optimum solution. The company’s expertise in logistics and project management as well as operation control and HSE will be vital to the successful outcome of the project. 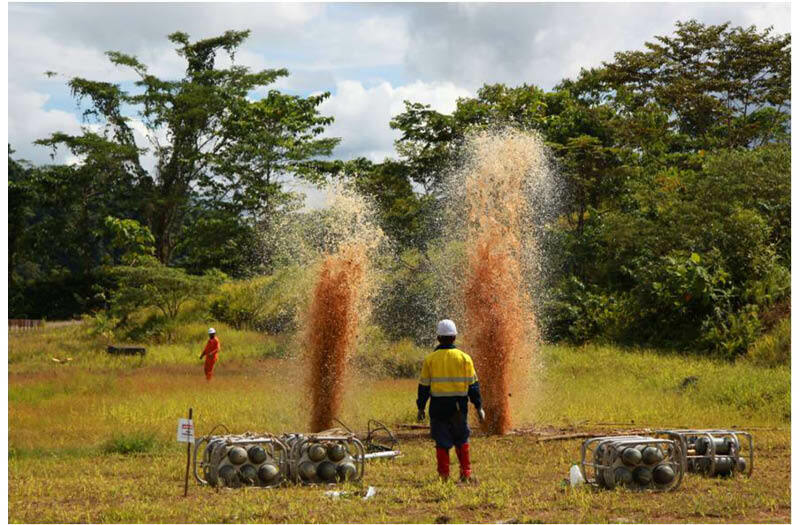 “In the first pilot project we were primarily interested in the logistical aspects of how to convey the sensors to their chosen locations, and to recover seismic traces in real-time, thanks to the use of a relatively simple portable downhole airgun source,” Pierre-Olivier explains. “One thing we discovered from the pilot was that the DART sensors do not all embed themselves vertically, which decreases the quality of the data submitted. As a result, we are investigating using multi-component microelectromechanical sensors (MEMS) in the DARTs to replace the existing geophones, which will help eliminate that problem and also allow us to keep the DART environmental footprint to a minimum, as MEMS are considerably smaller. As a consequence, the DARTs will also be much lighter, which should assist deployment. Bearing in mind the fact that all shothole drilling material must be flown to the base camp and then on to numerous source locations, the ability to deploy a large number of receivers – it is estimated that the drones could safely deploy about 4,000 receivers per day in harsh vegetated environments, and up to 40,000 per day in open environments – means that fewer sources will be required, which has advantageous safety and cost implications as well as being better for the environment. Real-time processing and rapid subsurface image delivery allows the interpreters to drive the survey by assessing the quality of the data acquired and the illumination of the geological formations directly and locally. They will therefore be able to adjust and optimize the acquisition plan in real time based on results, if necessary adding or relocating sensors easily with the drones. This means that the time between completing the acquisition and finalizing the processing will be reduced and the value of the information significantly increased, leading to quicker and better decision making. Real-time decision making is faster and involves fewer people, while drone deployment reduces personnel requirements on the ground as well, so there are significant financial savings in this aspect of projects undertaken through METIS. Further cost reductions are anticipated through the use of the purpose-built airships rather than helicopters and, by making the sensors biodegradable, there is no need to send survey teams out to recover them, which as well as being environmentally preferable, has financial and HSE advantages. 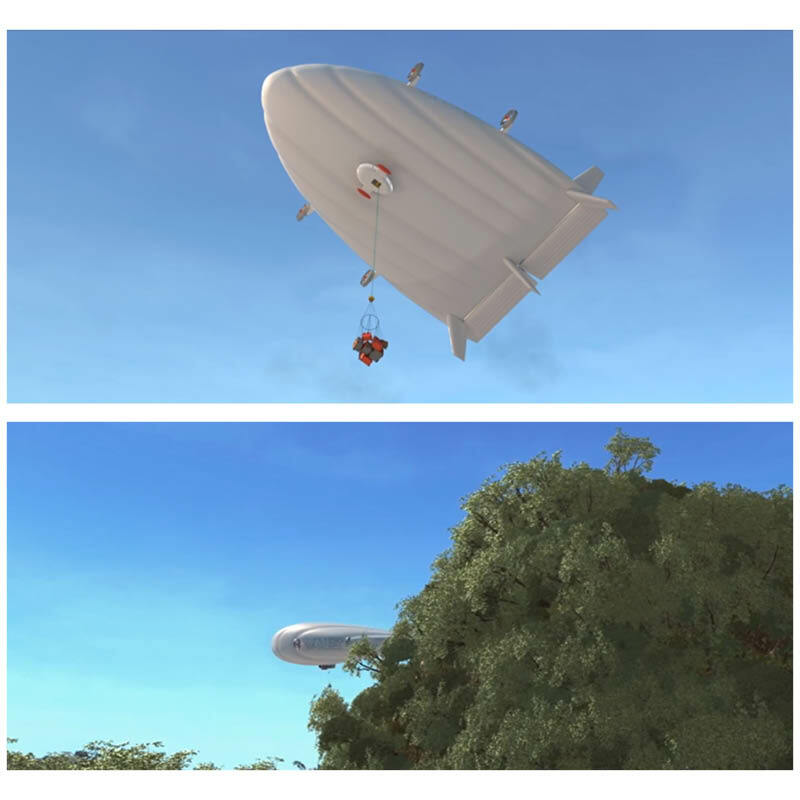 Simulation of the Total deployment airship technology. Image credit: Total. At the beginning, it seemed like a crazy idea, and some people doubted it could be achieved – but in the team we knew it was possible,” Pierre-Olivier says. “We did not initially anticipate that the project would be so big, with so many partners, but METIS has grown to encompass all aspects of an onshore survey and can be adapted to accommodate all geological data in the field, no matter how complex. It is ideal for resolving the challenges of 3D seismic acquisition and real-time processing in hard-to-access environments, such as foothills, but can also be adapted for deserts or areas crowded with infrastructure, or possibly in areas with unexploded ordnance, and for a variety of applications, from conventional 2D surveys to microseismic acquisition and seismic monitoring. “METIS is revolutionary because it addresses an entire acquisition system holistically instead of one little piece at a time, in order to optimize HSE, quality, cost and turn-around time,” he concludes.